With Brain Fruit, I was compelled by the idea that the brain is malleable and that it changes throughout our lives. 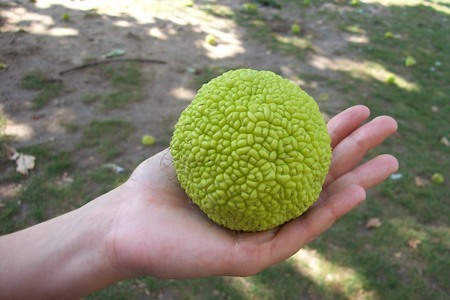 An important catalyst early on was the Osage Orange, a wonderfully strange, bright green fruit with a wrinkled surface that looks like brain matter. I loved the unlikely connection it suggested between the mind and a piece of fruit – between the brain and something that ripens and grows over time. I also relished the idea that this was something I could respond to directly from my own environment, so I collected Osage Oranges and made plaster molds from the forms. I pressed clay into the molds and the clay parts became the basic building blocks for the work. I was intrigued by the idea that this one simple part could be the foundation to a larger whole and the work evolved from there. I was further inspired by neurologists, like Oliver Sacks and Gerald Edelman, and their insights on the brains’ capacity to continuously shift, adapt, and make new connections. I was also moved by how much we still don’t know about the brain and more broadly about living systems in the world around us. With this in mind, there’s intentionally an element of science fiction in the work, of something otherworldly and ambiguous – where you can’t quite tell what these things are, what they’re made of, or what they might become. I was also thinking about this work in relation to the scale of our own bodies and in relation to the history of the human figure in sculpture. 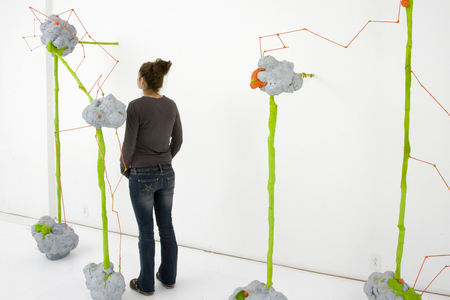 The forms tend to make you aware of your own physicality when you’re in the space and moving through them and I love the way this can potentially speak to how our experience of the world is mediated through both our brains and our bodies. I developed the Brain Fruit series from 2010 to 2012.